Sling comes to Apple TV while Chromecast passes it, Xbox moves away from TV, and AT&T bundles up anime. With special guests Kristi Kates and Mulango Akpo-Esambe. - Microsoft told the Verge: "After careful consideration, we've decided to put development of DVR for Over-the-Air TV on hold to focus our attention on launching new, higher fan-requested gaming experiences across Xbox One and Windows 10,"
- Xbox One S - A special, limited edition launch edition of the Xbox One S will be available in early August with a 2TB hard drive for $399. Two standard versions will be available soon after: a 500GB edition for $299, and 1TB for $349. - "viewers interested in anime, video games, niche action sports, and other fare off the beaten path." - Fend off Netflix from anime and Amazon from bundling. - Within the next 6-12 months, TV Everywhere from Comcast, Cox and MediaCom will start authenticating based on home WiFi. Customers will also get a single-sign on for TV network apps outside the home. Among participating networks are A+E, AMC, Disney/ESPN, Fox, NBCUniversal, Scripps, Turner and Viacom. But significantly NOT HBO. - Plex announced Thursday that an update coming at the end of June will allow NVIDIA Shield owners to use the device as a media server. Plex intends to expand server capability to more devices int he near future. - Netflix analyzed viewing habits across 100 serialized television series to determine how people binged. The average person took five days to finish the first season of the series and spent more than two hours at a time making their way through shows. They also developed a binge scale showing which genres of shows people devour and which ones they savor. Irreverent comedies and political drama were more likely to be savored while Thrillers and Horror were more likely to be devoured. - Nameless.tv is like Diamondclub.tv in a lot of ways. It collects Internet videos into channels like 90s nostalgia or Strangely satisfying, and puts a chat room alongside. Everybody watching a channel is seeing the same video and can chat with each other about it. It’s in beta for Web only but there are plans for a mobile app. - Netflix has purchased the rights to the movie “Divines” winner of the Caméra d'Or award at this year's Cannes film festival. It’s a French drama about tough teen (Oulaya Amamra), who gets sucked into the world of drug dealers in a Paris ghetto. Divines comes to Netflix later this year in every market but France, where it won’t show up until 2019. Netflix also bought The Discovery, a new movie from writer-director Charlie McDowell that's going to explore the consequences of an afterlife whose existence has been scientifically proven. Coming next year. On the Lookout: Voltron: Legendary Defender on Netflix. 11 episodes available now. 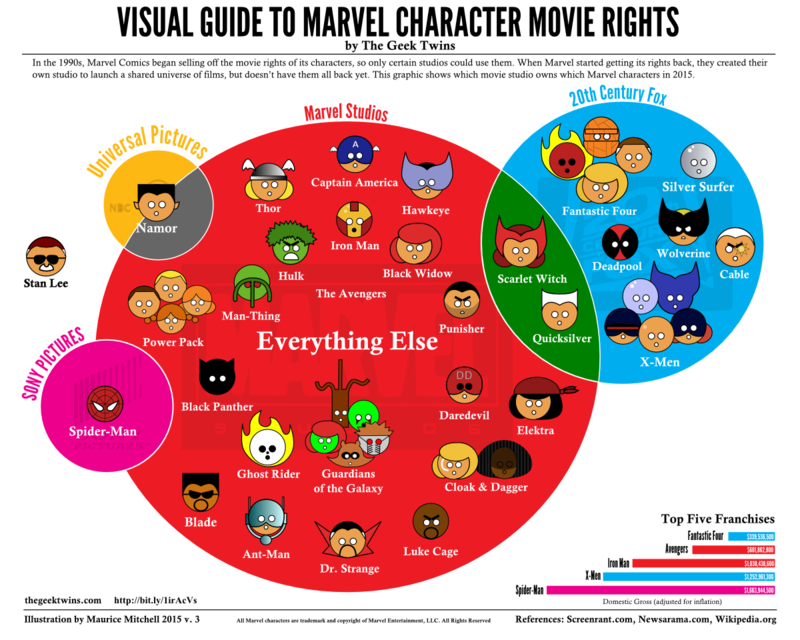 Here's a Venn diagram about Marvel movie rights. I was listening to your discussion about Apple/Amazon... I'm an Android fan boy, I won't buy anything on Amazon Prime Video until I have a Prime Video app for Android tablets, or they implement Googlecast support. If the 30 percent cut to Apple is whats keeping Amazon from creating an Apple TV app, what could possibly be the reason to keep Prime Video off Android? I have a feeling its the inflexibility of Amazon at this point? Is there something I'm missing? What about the possibility of Apple buying Hulu? I would say that Hulu qualifies as a, “…service such as Netflix.” Netflix has been up for sale in the past. Apple might see Hulu’s messy business model as an opportunity that they can fix, rebrand as Apple and get a lot more out of it than Hulu would currently cost. The acquisition might also give Apple some expertise as to how to run a video streaming service. Buying Hulu may even improve their business relationships with movie and television providers. ...Do you think Apple may acquire Hulu? Do you think it would be good or bad for Apple, Hulu or both?